Will your numbers come up? New to our collection of outdoor furniture are these fantastically quirky dice stools. Teak is an excellent outdoor wood due to its ability to be both water and rot resistant. Over the years, as its oil builds up and the teak ages it turns from a lovely honey colour to a beautiful silvery grey. Because of its natural hardiness it’s a wood that will last you year after year leaving you satisfied with your investment. The stools have a beautiful grain on them that is clearly visible bringing a wealth of character to the product. 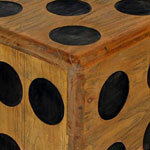 Dots of the dice have been delicately hand chiselled and painted to highlight the values on each side. Create your own unique outdoor garden set by pairing a couple of stools with your favourite table, or how about using the as side tables in the living room? We use the dice as an indoor stoll come side table. Its sold and well made.